I have spoilt my husband. How you all may be wondering. If I make soup for dinner, which happens at least thrice a week, he wants home baked bread as he finds the normal Supa bread tasteless. 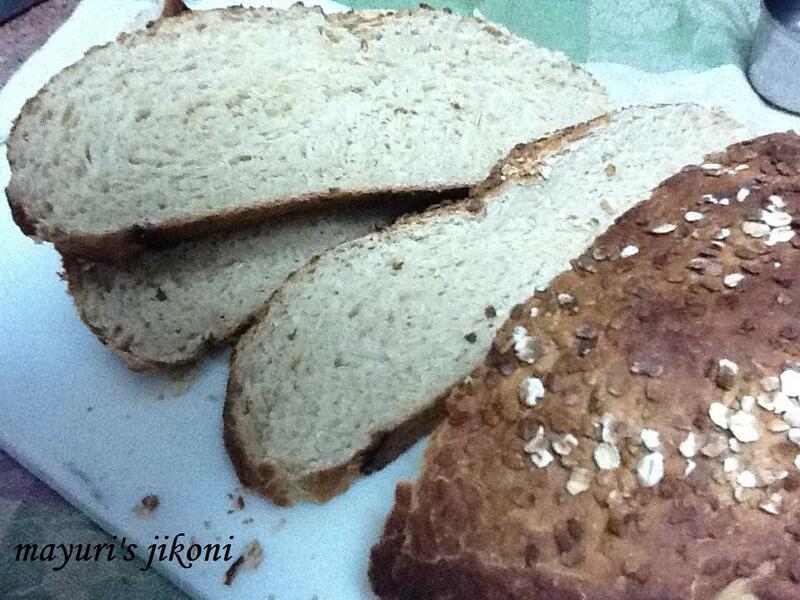 I have made oatmeal bread quite a few times with different options and all have turned out pretty good. Make it into a normal loaf, make it round, plait it or shape into rolls. Enjoy the smell of a freshly baked loaf . It is very therapeutic. Sieve both the flours together. Add salt and oats and mix well. Add sugar or honey to the warm milk. Mix till the sugar dissolves. Add yeast to the flour and mix well. If you are not using instant yeast, then let it activate in ¼ cup of warm milk with a teaspoon of sugar from the measured sugar or honey. Leave for 10 minutes until the mixture becomes frothy. Rub in the oil or butter into the flour. Add the yeast mixture (if you not using instant yeast) and milk and form a dough. The amount of milk required will depend on how much is absorbed by the flour and oats. If the dough is sticky, dust the worktop with extra flour. Knead the dough using the heel of your palm for nearly 10 minutes or using a kneading machine. The dough should become soft and silky. Form the dough into a big ball. Rub oil all over it. Grease a big bowl with oil. Place the dough in the bowl. Cover it with a cling film. Place the bowl in a warm place. Knock the dough down with your knuckles gently and bring it together. Let the dough rest for 15 minutes. Using extra flour or oil, shape it into the required shape. Grease the pan or tray and place the shaped dough onto it. Brush the top with milk or melted honey. Sprinkle oats over the top. Place again in a warm place till it rises for nearly 1 to 1½ hours. Place the risen dough into the hot oven and bake till it turns golden brown on top. Loaves take about 25 to 30 minutes to get baked whereas rolls take about 15 to 20 minutes. Brushing it with honey makes the bread taste slightly sweet. Can use only plain flour instead of wheat if you like. If you use only wheat flour, then increase the amount of yeast required to 3 tsps. If you are using a pan or loaf tin, its usually better to let the dough rise to at least 1 inch above the rim. If you shape the bread and place it on a tray, then the dough should become nearly double the original size. Do not knead the dough on a cold worktop. It will kill the yeast. Can use an egg wash instead of milk or honey for the topping. For kneading technique and egg wash, check out my rosemary sunflower seed bread. For the first proving stage, I like to place the whole bowl into a big clean plastic shopping bag and tie it up.